Although the diatoms may have existed since the Triassic, the timing of their ascendancy and “take-over” of the silicon cycle occurred more recently. Prior to the Phanerozoic (before 544 Ma), it is believed that microbial or inorganic processes weakly regulated the ocean’s silicon cycle. Subsequently, the cycle appears dominated (and more strongly regulated) by the radiolarians and siliceous sponges, the former as zooplankton, the latter as sedentary filter-feeders primarily on the continental shelves. Within the last 100 My, it is thought that the silicon cycle has come under even tighter control, and that this derives from the ecological ascendancy of the diatoms. However, the precise timing of the “take-over” remains unclear, and different authors have conflicting interpretations of the fossil record. Some evidence, such as the displacement of siliceous sponges from the shelves, suggests that this takeover began in the Cretaceous (146 Ma to 65 Ma), while evidence from radiolarians suggests “take-over” did not begin until the Cenozoic (65 Ma to present). The expansion of grassland biomes and the evolutionary radiation of grasses during the Miocene is believed to have increased the flux of soluble silicon to the oceans, and it has been argued that this promoted the diatoms during the Cenozoic era. Recent work suggests that diatom success is decoupled from the evolution of grasses, although both diatom and grassland diversity increased strongly from the middle Miocene. Diatom diversity over the Cenozoic has been very sensitive to global temperature, particularly to the equator-pole temperature gradient. 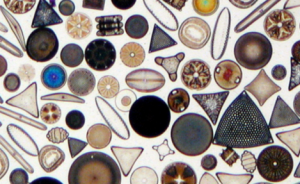 Warmer oceans, particularly warmer polar regions, have in the past been shown to have had substantially lower diatom diversity. Future warm oceans with enhanced polar warming, as projected in global-warming scenarios, could thus in theory result in a significant loss of diatom diversity, although from current knowledge it is impossible to say if this would occur rapidly or only over many tens of thousands of years. So what’s wrong with this if anything? Just to get it out of the way, let’s start instead with what’s right: the passage permeates doubt and cites the observed evidence. It could go further by detailing multiple competing hypotheses and adding a pro/con discussion of each one. But this is not a published scientific paper so they get a pass for simply leaving room for doubt. Now onto what’s wrong. First off, this passage has no bearing whatsoever on the future – the passage can neither be falsified nor does it predict anything. If right 0% or 100%, it doesn’t make any difference for our understanding of the diatoms. They might counter with: “Well, if we know the relationship to other organisms, we might use one to better understand the other”. This is fine except for the circular logic – we observe similarities to build the “evolutionary tree”, hence we cannot use said tree to learn something NEW about similarities. Second, the evolutionary story presented cannot be independently verified. We cannot confirm or infirm this story. All we can do is note that this story is compatible with other such stories. However, the whole collection may be wrong. There’s a real danger in people getting attached, and some dedicating their careers, to these stories to the point where they become irrationally supported dogmas. Finally, the implications of the story are not explored. What if anything from this passage can we test? Silica in living organisms is restricted to diatoms and sponges but this seems totally uncorrelated with evolution as diatoms are supposed to be related to red algae. “A period when diatoms were unsilicified” comment is based on nothing other than the desire to fit the “just so” story. How does the “take-over” of the silicon cycle occur? Most biology and medicine books include a chapter on evolution right along one on Mendelian genetics. However, while Mendelian genetics can readily be verified experimentally and has real and immediate implications in medicine, biology, food science and much more, the “knowledge” that organism A evolved from organism B, or the two are just products of “convergent evolution”, adds nothing to our understanding of either A or B. Posted in Views and tagged Diatoms, evolution, Mandatory, Statement.